VALZHEIMER FREEBIE BONANZA 2016 - FIVE FREE PRODUCTS IN ONE! 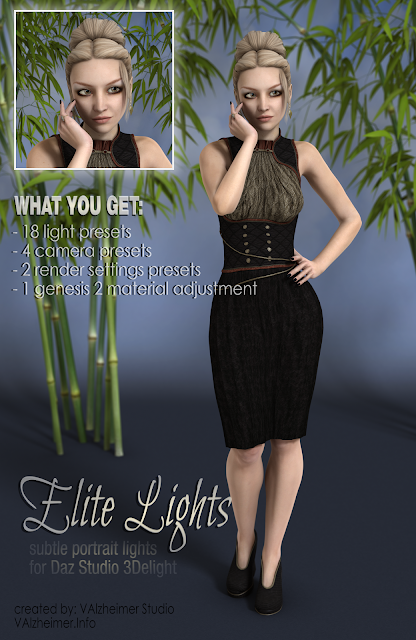 In total in this post you can download: 18 light presets for Daz Studio 3Delight render engine and 120 free expressions for Daz Studio figures! Have a happy and prosperous New Year 2016! 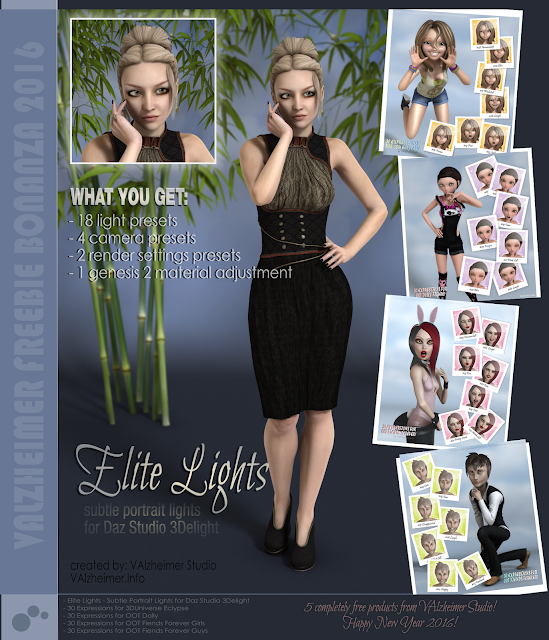 - You are allowed to use these presets for your personal and commercial artwork. - You are not allowed to reupload, direct/hotlink to hosted download, alter, or use content of these packs or promotional images in original OR modified form in any way for commercial or non-commercial redistribution, including but not limited to magazines, blogs, websites, forums and social networks. - VAlzheimer Studio reserves ownership rights over packs presented on this page and details and penalties from Copyright Notice apply in any case of abuse. Contains 18 light presets, 4 camera presets, 2 render settings presets, 1 material/skin adjustment for Genesis 2 figures. All presets are hand-dialed and adjusted for Genesis 2 to be rendered in 3Delight render engine. Created and tested in DAZ Studio 4.7 Pro, doesn't contain Poser files. All poses are hand-dialed and adjusted for Eclypse figure. Created and tested in DAZ Studio 4.6 Pro, doesn't contain Poser files. All poses are hand-dialed and adjusted for Dolly base. All poses are hand-dialed and adjusted for Fiends Forever base. THANK YOU FOR FOLLOWING AND SUPPORTING VALZHEIMER STUDIO!